About 20–30% of all cancers exhibit chromothripsis, a catastrophic genetic event in which sections of the chromosome effectively shatter into multiple pieces, but can’t reassemble correctly, resulting in missing, duplicated, or misaligned DNA sequences. Scientists at the German Cancer Research Center (Deutsches Krebsforschungszentrum, DKFZ) studying mouse models and human tumors now report on new insights into the mechanism that underpins chromothripsis, which implicates failure of the cell’s genetic repair system, and overexpression of the Myc oncogene. Chromothripsis and another type of genomic instability, chromoanasynthesis, are involved in many different tumor types and some congenital diseases. Research teams including the DKFZ scientists have previously identified chromothripsis in cancers such as aggressive childhood brain tumors, but the triggers for this kind of genomic chaos haven’t been understood. 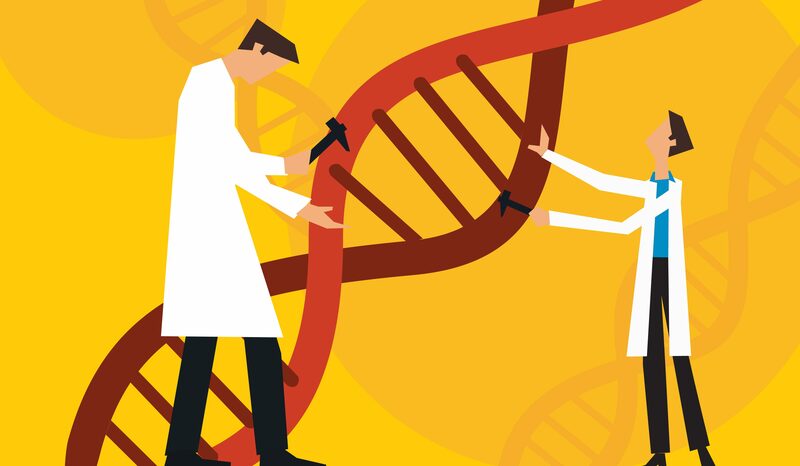 In their latest studies, Dr. Ernst’s team tested the effects of genetically switching off the homologous-recombination (HR) repair or non-homologous end-joining (NHEJ) DNA repair mechanisms—the two major repair processes for DNA double-strand breaks in mammalian cells—specifically in neural precursor cells in mouse models. They found that the animals developed medulloblastoma and high-grade glioma brain tumors, which commonly exhibited chromothripsis. In the majority of cases, genomic chaos was accompanied by Myc oncogene amplification. “If the DNA repair is defective and Myc nevertheless stimulates the division of these damaged cells, the risk of chaos in the genome is particularly high,” Dr. Ernst comments. Their results indicated that Myc amplification wasn’t just consequential to DNA repair inactivation. “We showed in the mouse models that, even though Myc overexpression alone is not sufficient to induce catastrophic events, amplification of Myc and Mycn are linked with catastrophic events, and may not simply represent a consequence of these in all cases,” they write. The team also discovered significant Myc/Mycn amplification in human brain tumors with complex genome rearrangements. Further analyses again indicated that the correlation may be causal. “… this association is not merely due to a selective advantage provided by the oncogene as a consequence of the massive rearrangement, but may in some instances be related to a possible facilitation of catastrophic events by Myc or Mycn activation,” the authors write. The link between DNA repair defects and complex genome rearrangements was subsequently found in other cancer types, including melanoma. “Therefore, inactivation of HR and NHEJ factors is linked with complex genome rearrangements across various tumor entities,” they continue. “Altogether, our findings on the tight links between DNA repair deficiencies and catastrophic events and on synthetic lethality approaches bear the potential to identify targets for new therapeutic strategies for tumors with complex genomic rearrangements,” the authors conclude.